We are committed to providing our clients with the very best service, and their horses, ponies, mules, and donkeys with the very best hoof care. We have experience and success maintaining healthy hooves as well as assisting in the recovery of hoof injuries and diseases like laminitis and navicular syndrome/disease. We enjoy helping horses and owners with the transition to a healthy natural barefoot lifestyle. We are also proud to be EasyCare Dealers and offer personalized access to the entire line of EasyCare products and expert hoof boot fitting. Our service area(s) include Western Washington and the Olympic Peninsula. Please call or email to find out when we'll be in your area! Please explore our website as we complete it. We will update it often, and we encourage you to contact us for more information or to make an appointment. Please use the form below for email, or telephone at 360-385-1318. 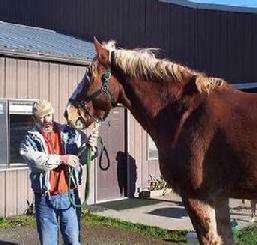 Jim and Willy the Belgian - 2300lbs of wonderful!